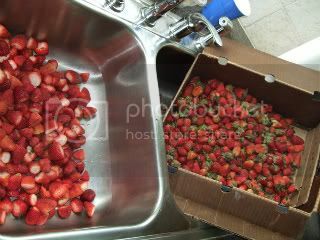 I got all my organic berries as "culls" the ugly ones the farmer picked out before packing them. he gave them to me after I ever so humbly asked him what he would do with the ugly ones.... and asked if there were any available. I took a few photos of the process. 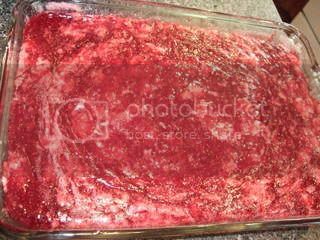 I used pectin. I like the fact it cuts down the cooking time in half. I do see a value in not cooking the berries to death. they seem to taste better, and certainly the jam is not as dark. here is my process, which is ever evolving. 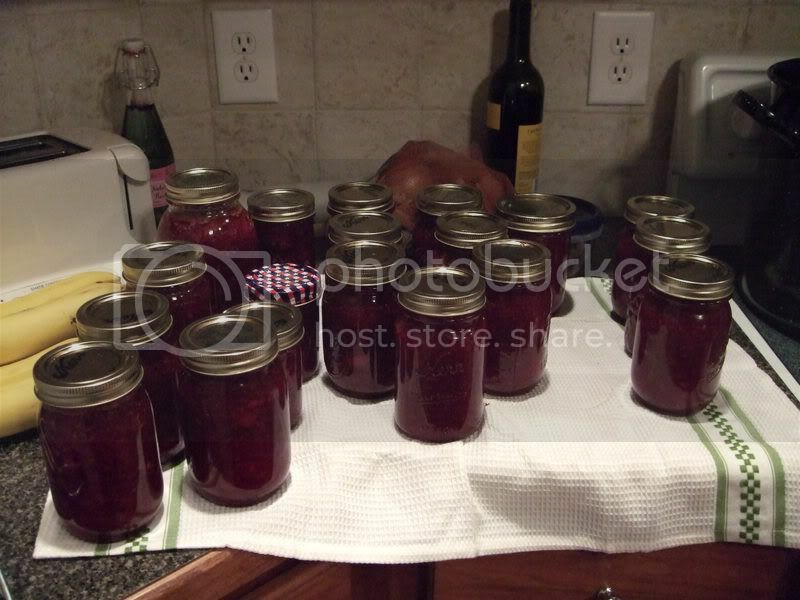 the last two times I made jam it came out syrupy. it was not thick enough for a Sandwich; which by the way is my real motivation for the Putting up of jam, my peanut butter sandwiches are so much better than when I use store bought jam. 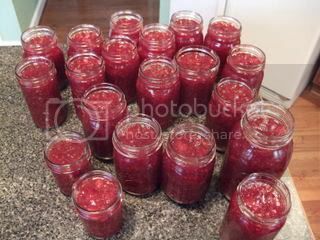 It is also quite good on oatmeal... but we cannot go on about its never ending usefulness..
recipe called for crushing the berries, to release some of the scant pectin in strawberries, I ran them through the blender lightly. chopped them a bit. It worked well and left me chunks of fruit. 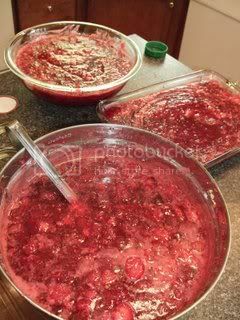 It has been said.. do not rush the jam making process or double your recipe, it will adversely affect the setting of the jam. Easy solution, use two pots!!! if you can handle stirring two of them rapidly. Looks like I got a good set this time! Follow the directions!! All components need to be in their prescribed proportions for a good "set". look at all these jars!!! finished the day with 3 splatter burns on my hands and 2 gallons, 3 quarts all together. during the processing phase in the water bath, i lost one jar when the bottom cracked off as mentioned before. this ought to get me through the year........ I hope!!! CHEERS!!!! and happy berry season!!!! Very nicely done, from one jam maker to another. That was a good deal you got from the farmer. I won't have strawberries until end of june beginning of july and then I will be the one sitting in the middle of patch munching away, and imagining jars of jam. 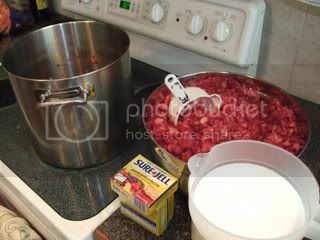 Good blog, and great pics of the process that you use! Like Droopy and Biita I won't have any fruit until the middle of summer. You certainly got a great deal with those 'ugly' strawberries. 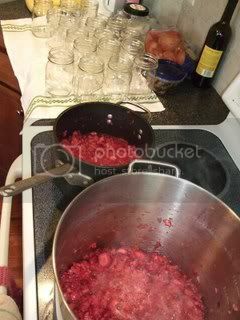 Who cares what they look like when they make so much lovely jam!!!! Wish I could taste some for myself as it looks really delicious. Well done!!!! I love strawberry anything but Strawberry Jam and buttered toast ummmmm. Oh I'm very envious!!!!! Forgive me please, Strawberries are my absolute weakness! Oh my! Reminds me of my mothers kitchen cabinet. She was always canning something. I just buy mine, although I know that homemade is better.